Make-ahead marinated zucchini recipe: The perfect summer side. Maybe you have an avowed zucchini hater on your hands and you are determined to prove him wrong. Or your garden is exploding. Or your neighbor’s garden (or C.S.A. or farmers’ market)—they too are probably exploding. 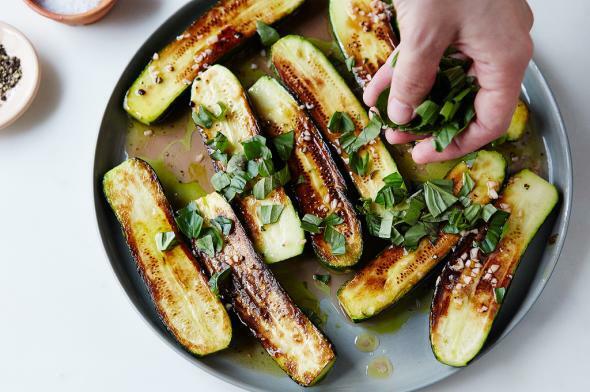 To get more flavor out of zucchini, you might have tried letting it soak in a marinade for hours before throwing it on the grill (you’re not alone) or drumming up a distracting sauce. Or my time-tested technique, called: Adding more butter. There’s a much better way that you probably haven’t thought about, because people won’t usually tell you to serve zucchini long after it’s been cooked. It’s time for that to change. People who tell us what to eat seem to think we have an aversion to letting cooked food sit around. If we are to believe TV commercials, Americans want their meals flash-fried, crisp-tender, fresh-cut. In one wing of my family, restaurants are judged by how steamy the bread basket is when it’s set on the table. For some reason, fajitas are served to us still-sizzling, even though this defies all rules of resting sizzled meat. As many of us have realized, however, a lot of food tastes better after it sits a bit, letting time finish the job we started. (For an entire cookbook on the subject, check out Cucina Fresca by Viana La Place and Evan Kleiman.) Flavors develop with time, and all their nuances come out when they’re no longer steaming like a lobster topper. The extra advantage to strategically letting cooked food (like this zucchini) sit is that you no longer have to be cooking till the last minute. This also means you’ll have more chances to sneak a taste and know what you’re getting—and tweak as you see fit. 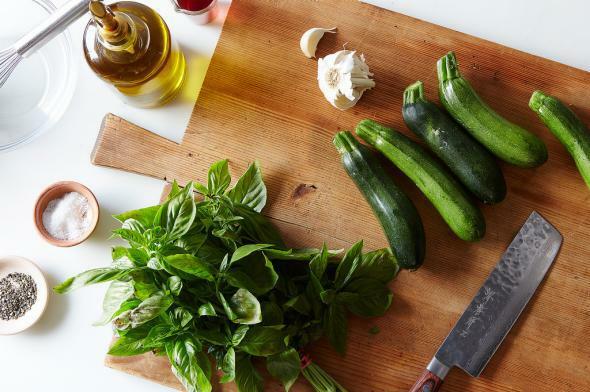 Because the zucchini is already cooked through and relaxed, the marinade seeps in more quickly and thoroughly than had the order of operations been reversed. The zucchini boats become bright and aromatic, but hang onto their fresh structure and sweetness. It’s pretty much the simplest, best summer side, whether you’re serving it to a dinner party, your family, or just you. Slightly adapted from Canal House Cooking Volume No. 8: Pronto! Got a genius recipe to share—from a classic cookbook, an online source, or anywhere, really? Please send it my way (and tell me what’s so smart about it) at kristen@food52.com. Thanks to Food52’s Design and Home Editor Amanda Sims for this one!